Most business people have a good feel for what a polished event looks and feels like. With as many events as we all regularly attend, you also understand when an event feels poorly done – an experience that no business person wants to have! After all, your business events are a reflection of you as a brand. If a client or customer attends an event where their name is misspelled or their dairy allergy was ignored, they may question what other mistakes are being made. That’s why ensuring a polished event is critical to you as a brand. Here are four tips to keep in mind when planning your next event. 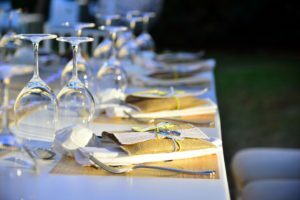 Guests remember the small details of an event because of the way that it makes them feel. Polished events leave guests walking away, talking about how much they enjoyed the event. That includes appropriate decorations and atmosphere, delicious food, and strong interaction with the business team. While your guests may not remember the color of the tablecloths, they will remember that your table looked beautiful! Communication remains critical to ensuring the small details. Know ahead of time what type of event you want (fun? elegant? quirky? informational? ), then ensure all details point in the same direction. The quality of food and service at your event can make or break your guests’ experience. Food is regularly the number one complaint by attendees at professional events. So where do you start? If you are just starting out working with local catering companies, start by asking around with other professional business owners. Who do they use? Who do they trust? 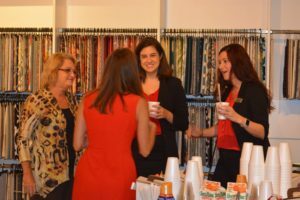 You may also consider talking with your local Chamber of Commerce about companies that are affiliated and have a good standing with the chamber. Check their reputation on reputable watchdog groups like the Better Business Bureau, and even customer reviews on Facebook and Yelp. Overall, these factors should give you a good sense of their caliber as a service provider. Once you have settled on a reputable catering company, make sure that you have worked with them to create a menu that your clients will enjoy, but that also brings pride to their chefs as culinary artists. Most chefs take a great deal of professional pride in the work that they do and are willing to accommodate any reasonable requests. 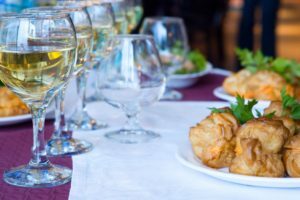 In addition, if there are expectations for the caliber of the catering company’s wait staff, make sure that you discuss it verbally and include it in the catering contract. Set clear expectations from the beginning of your business relationship with the catering company. Open communication will ensure that your partnership is long and fruitful. One of the most common challenges that I see when I set-up or attend corporate events is that the professional staff of the company often has absolutely no idea what they should be doing at their event. While as a manager, you may assume that networking skills naturally come with being a business person, networking is a skill that must be cultivated and practiced like any other! The day before your event (no matter the size), hold an all-hands staff meeting. Make sure that each staff member has a clear assignment for event set-up, during the event, and during breakdown. No one should simply be standing idle! It can also be helpful to prepare the staff member ahead of time on who will be in the room with important information. For example, at a recent fundraiser that I attended, a well-networked Director of Development pulled his CEO aside to let him know that an important public official was in the room. He gave him background information on the conversations that he had already had regarding his support of the charity. He then brokered an introduction between the guest and the CEO. The end result? A secured donation. Non-profits are of course not the only businesses that can benefit from productive staff interaction with guests. By setting the expectation with your staff that they are there to provide five-star service to your guests, you have created a memorable experience for guests and staff alike. Every event will have its challenges. Expect frustrations to pop up along the planning and execution process. 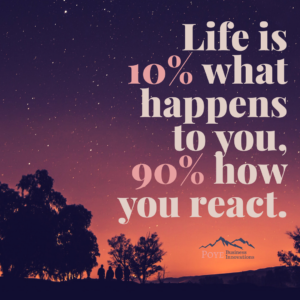 Running a business is 10% what happens to you, and 90% the attitude and commitment with which you handle those situations. There will always be factors outside of your control – a caterer that cancels, a speaker who arrives late, a staff member that forgot to wear the corporate colors. Guests will enjoy the event as much for being in the company of you and your staff as they will for the canapes and the color of the linens. While Point #1 (“mind the details”) is critical, there is a sweet spot where you don’t allow yourself to get caught up in the details and miss the overall vision of your event. Keep in mind the purpose of your event and set your sites on executing that vision: whether your event is to cultivate new clients or donors, to appreciate the clients that you have, or to showcase a new product. Like so many things in life, a polished event is all about balance between the small details and the larger purpose. I am the first to admit that I can be a perfectionist, which means I have to be incredibly mindful not to get caught up in the details. For that reason, when I work with corporate teams, I regularly repeat the overall purpose of the event out loud to the group. That repetition sets clear direction for the staff (Point #3) and ensures that I’m on the same page as my client, while also reminding me to keep balance. If you know that one of these points is a major blocker for your ability to execute your vision of a polished event, I recommend being open and honest about it. 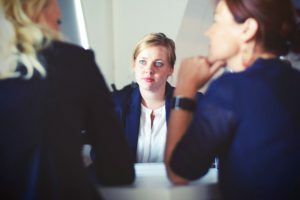 You will find that your staff will not only respond enthusiastically to helping keep you in check, but that it will likely encourage their own honesty about their shortcomings.